Utopia (n.): a place of ideal perfection especially in laws, government, and social conditions. The definition of utopia itself is simple to comprehend. It’s the description of a perfect place to live, a locality where everyone coexists and acts in pursuit of collective security and benefit. It’s a worthy goal to strive for, something we as humans would all arguably enjoy. Yet no such utopia has ever existed for an extended period of time. Why? Because the implementation of such an idea is far from effortless. Both our front and back lists contain titles which explore the pursuits of pure utopias. Each with a slightly different approach, these books comprise a fascinating narrative of coexistence, couched in the Pacific Northwest’s rich history as a haven for communal living. In 1970, Margaret Grundstein abandoned an Ivy League education to follow her activist husband into the backwoods of Oregon. There, they lived with ten friends and a rotating cadre of strangers, building what they believed to be a version of utopia. Resources grew scarce and relationships frayed, leaving Grundstein faced with difficult questions of feminism, labor, and love. A gripping memoir, Naked in the Woods forces readers to explore the boundaries of their own human nature and societal expectations. Since the establishment of the Aurora Colony in 1956, Oregon has housed nearly three hundred communal experiments. Ranging from the religious and Socialist groups of the nineteenth century to the ecologically conscious communities of the current century, Kopp’s work serves as the first comprehensive source for the state’s rich utopian history. Eden Within Eden will intrigue readers with its rich detail and encompassing look at broader social, political, economic, and cultural aspects of Oregon’s history. Structured around a series of linked narratives, Kopp’s work traces the history of Home, Washington, an anarchist colony founded in 1896 to promote freedom and tolerance in the midst of a rigid Gilded Age society. Over time, the community became notorious for its open rejection of contemporary values; members were arrested, sent to the Supreme Court, and even turned into private spies. More than a simple history, Trying Home offers insights and reflections from the author as complex as the community about which he writes. Surrounded by ever-increasing levels of technology and modernization, how can we lead sustainable and responsible lives? Building a Better Nest delves into this question through the author’s own adventures in home construction. Writing with unfailing wit and humor, Hess looks for answers in such places as neuroscience, Buddhism, and her ancestral legacy. Sustainability, she discovers, is all about cooperation. Well, that and active attention to the local watershed, and the widening income gap, and disappearing species, and overtaxed resources, and … Suffice it to say, sustainable living requires a lifetime of cultivation. Follow Hess’s progress and method in Building a Better Nest. Beginning definition taken from the Merriam-Webster dictionary. Summer is nigh upon us, and do you know what that means? It’s time to hike—and walk, and run, and bike, and paddle—your way through the beautiful Pacific Northwest! But before you embark on any adventures, browse the books below to see which field guides and handbooks might serve as helpful companions. Our most popular field guide profiles 120 Oregon rivers, offering a bevy of color photographs, history, and tips for all manner of outdoor enthusiasts. Described by WaterWatch of Oregon Executive Director John Devoe as “an essential tool for anyone who paddles, fishes, explores, and wants to understand the natural history of our rivers,” Palmer’s work serves as an unprecedented reference for Oregonians and visitors alike. This updated second edition offers a comprehensive look at the Pacific Northwest’s 169 Carex sedge species. Notoriously difficult to identify, sedges can be tackled using this helpful guide, which contains more than 650 color photographs and distribution maps. Learn the tricks of the trade employed by botanists and ecologists to use in your own gardening, landscaping, or citizen science pursuits. Catered to naturalists, conservationists, and wildlife enthusiasts with all levels of experience, this companion guide includes stunning, vibrant photographs of Oregon’s Odonates and identification tips. Take the guide with you on any excursion to learn more about the distribution, habits, and natural history of the order. 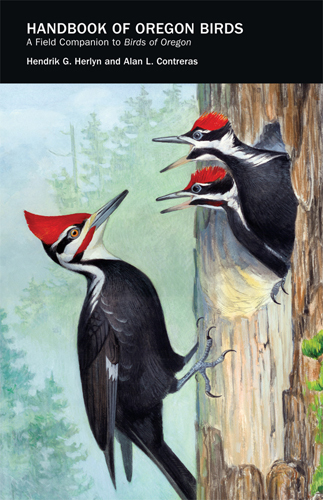 The essential guide to Oregon ornithology, the Handbook provides a detailed field reference for birders interested in seasonal patterns, habitat information, and breeding and winter maps. Intended for more experienced birders, the guide includes specialized identification aids on such challenges as flying alcids and immature swallows. A useful guide for both beginners and specialists, this revised edition includes keys to 586 lichen species in Oregon and Washington and some parts of Idaho and Montana. With an emphasis on forested ecosystems, Macrolichens offers users an illustrated glossary, as well as ecological challenges like air quality currently faced by the species. The guide includes more than 240 color photographs for improved identification. Valuable to botany students and beginners, this revised handbook helps identify hundreds of plants found between the Cascade Mountains and Pacific Coast. Educational components include a glossary of botanical terms and a host of illustrations that highlight indentifying details. For years, The Handbook of Northwestern Plants has been widely used as the premiere guide for plants in western Washington and Oregon. Turn to this field guide for the definitive authority on the animal kingdom’s second largest phylum. Browse its pages for information on the snails and slugs of Oregon, Washington, Idaho, and western Montana. As a reference, Land Snails and Slugs provides rich illustrations, characteristic traits, and biogeography details. Still looking for more inspiration for your outdoor adventures? Look through our entire collection to learn more about conservation, ecological history, and the state’s best kept natural secrets. Citizens and the media regularly subject American politicians’ lives to public scrutiny. We hear about scandals. We hear about philanthropic visits and awards. We hear about financial troubles and financial successes. Yet rarely do we receive a holistic portrait of such political leaders, one that covers their lives unflinchingly and honestly, yet with tact. Author and historian William G. Robbins manages to do just that. 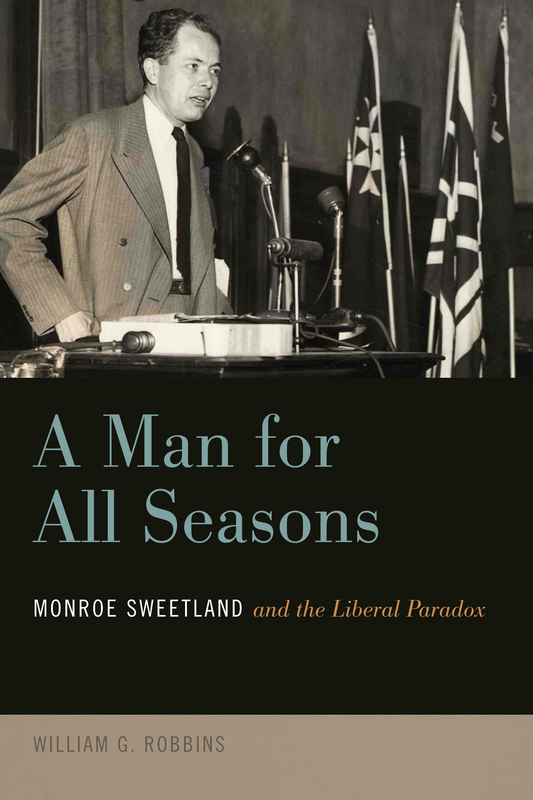 He joins us today to discuss the impetus behind his latest work, A Man for All Seasons: Monroe Sweetland and the Liberal Paradox. Monroe Sweetland’s name first emerged in a graduate seminar at the University of Oregon in the late 1960s—as I recall—associated with a romantic sounding, radical political organization, the Oregon Commonwealth Federation. Sweetland’s name surfaced again decades later at a labor history meeting in Portland where a friend identified him as the person who asked a question from the back of the room. In subsequent visits to Portland I would occasionally see him in the vicinity of Portland State University, white cane in hand and usually in the company of a graduate student. Sweetland’s long public career provides a literal tour through Oregon and national history since 1930—field organizer for the socialist League for Industrial Democracy in the early 1930s, founder of the radical Oregon Commonwealth Federation in 1937, field director for the CIO War Relief Committee in 1941, two years with the Red Cross in the Pacific, publisher of Oregon weekly newspapers, 1948-1963, member of the Oregon legislature 1952-1963, journalism lecturer in Indonesia 1963-1964, and legislative director of the thirteen western states for the National Education Association (NEA), 1964-1975. Already well known to leading national political figures, Sweetland achieved two major accomplishments with NEA—he was the principal architect of the Bilingual Education Act of 1968 and led the agency’s push for the age-eighteen vote, the Twenty-Sixth Amendment, in 1971. 1A Man for all Seasons is the title of Robert Bolt’s 1966 Academy Award-winning film of Thomas More, the 16th century counsellor to England’s King Henry VIII, who refused to sanction the king’s divorce so that he could marry another woman. For his principled stand, More was tried and executed. William G. Robbins, Emeritus Distinguished Professor of History at Oregon State University from 1971 to 2002, is the author and editor of several books, including Monroe Sweetland. Following a four-year enlistment in the U.S. Navy, he earned a B.S. degree from Western Connecticut State University and M.A. and Ph.D. degrees from the University of Oregon. He is currently at work on the sesquicentennial history of Oregon State University as a land-grant institution.